[Andrew] has appeared here once or twice before, most notably with his Cadillac PHEV. This is almost the opposite of the old Sony PCM adaptors (eg the PCM 701) that encoded digital audio as video for storage on a VCR. yep…I have a PCM 501 (with PAL BMAX) and a Sony DAT. Both still work. Same cannot be said for numerous CD and DVD players. Actually audio DAT tapes were very common, just not in the home market where the music labels have succeeded in killing it. DAT was the gold standard for music demo recordings, doing field reportages (together with a Sony minidisk) and archiving in radios. Compact, robust (unlike normal studio tapes which spilled easily!) and excellent recording quality. E.g. at the radio I have worked at, the law required us to archive every minute of everything that has been broadcasted live for several weeks (in case of complaints), so putting a tape in the DAT recorder and starting it was the very first thing the sound engineer did when going on air. Came here to say this, but you said it all already. I’d just add that a lot of records weren’t just demoed but actually mastered to DAT, since it was essentially the highest fidelity and most reliable standard around. You’ve done the opposite of what Phillips did to record PCM audio for CDs onto U-Matic video tape. Using PAL format it worked out to exactly 44.1Khz. NTSC would’ve resulted in a similar number but not exactly 44,100 samples per second. How about putting DVD compliant MPEG2 with AC3 audio onto DAT? According to Apple, according to wikipedia, commercial DVD Videos have a data rate of about 4-8MBit/s or 0.5-1MByte/s which is quite a lot more than 1.5MBit/s or 187.5 kByte/s. MPEG 1 and 2 was quite bad a keeping the bit rate down since they had to run on machines of the time, complexity vs speed. Also a 60 min. DAT tape can hold about 659MiBytes of audio data. For comparison a 60 min. CD holds about 605MiBytes of audio data and a 60 min. DVD Video is about 2.2GiBytes (DVD-Rs says 120min 4.7GByte, 4.4GiByte). So think of DAT as slightly faster than a single speed CD. Ignore me. Commented in the wrong place. I blame my phone. That’s 1.4 Mbps, which is barely enough to carry a broadcast quality SD video channel over the air. One DVB-T2 mux is typially carried over a channel bandwidth between 20 – 30 Mbps and usually carries 5-8 channels, resulting in 2-3 Mbps allocated per channel. If the broadcaster is being extra cheap, they stuff in up to 12 channels, which results in around 1.5 Mbps per channel and results in the image breaking up regularily. The trick is that not all the channels require all the bandwidth all the time, so they can use variable bit rate to encode the parts that require more data. Especially with movies, they can check the data profile in advance and shift the film around in the broadcast schedule to minimize the amount of bandwidth overlap – though this gets increasingly difficult the more channels you have in the mux. In terms of the DAT tape, the situation is bad because you don’t have this dynamic headroom. 1.4 Mbps is all you get, which results in the image breaking up like in a bad DiVX movie when people used to stuff them on CD-Rs. Although DVB-T2 needs to include all the overhead of FEC as well as the packetisation and associated tagging. Streaming off DAT doesn’t need that – the overheads seem a bit smaller. How much those overheads eat into the bandwidth, I don’t know though. Most DVB content is encoded offline well before broadcasting – exactly because of the dynamic bandwidth allocation. The “live” channels also tend to be delayed by a couple minutes to half an hour to give them time to compute the bandwidth allocation and use predictive encoding. I was already taking that into account. For a mux bandwidth of 20 Mbps you have perhaps 15 Mbps of useful bandwidth, including the redundancy and error correction as well as the side channel data and other stuff. Divide that into approximately 10 channels, and you get about 1.5 Mbps net bandwidth for video. Except again for the dynamic allocation of more bandwidth when needed, which isn’t available on the DAT. Vaguely correct. He’s using H265 though, which invalidates your calculations. In my experience, you can squeeze better quality than you think into a lower bit rate by using more computationally intense methods of encoding. Handbrake has settings that allow better video quality at lower rates at the expense of longer encoding times. I have seen full length movies compressed down to 720p to fit on a 700MB CD that have looked quite excellent, but encoded at 0.1 real-time speed. That’s with MPEG4 and h264. H265, as is being used here, can store up to 2x the detail at the same bitrates as h264 at the expense of higher encoding times and more work for the CPU to decode. TL,DR: yes you can get good quality at 1.4mbps, you just need to pay attention to your encoder settings. They do look good when there’s not much information to encode – think something like anime where all animation is drawn at 12 frames per second and the rest consists of simple parallax movements of static imagery – but there’s always content and occasions where you simply need more bandwidth and you have to drop data. Information cannot be compressed arbitrarily small. These compression methods are all based on throwing out data that is “non-essential”, ie. degrading the image quality in a way that people would ignore, or at least forgive. Out of curiosity, how much of a buffer are players assumed to have? If an entire movie has been encoded in advance, why does it need to be streamed strictly-real-time? Why not let the stream get a few seconds ahead when the bitrate is low, so there’s some squish-room to encode fast action sequences a few minutes later? That’s exactly what is going on here. Some video data (a few seconds worth) are written to disk before starting up VLC. This helps with bursty h265. and dat 72 stores 36gb of uncompressed data, that’s already more than a single layer blu ray disc. This is more along the lines of DSS-1 or DAT 2.6. DAT 72 or rarely DSS-5 is the fifth generation of Digital Data Storage, DSS. DSS-1 was based on this technology that was found in Digital Audio Tapes, DAT. Back in the days, DAT was more or less common amongst people who record their own music – CDRs were expensive and as soon as they were available, it only took a few months to show how bad they were in keeping their data. Even my oldest DAT tape still works. NONE of my oldest CDRs can be read anymore. While I agree with most of what you say, I disagree with your claim that basically all CD-r’s are bad. I worked at a company that used CD-r as early as 1992. I joined in 1994 and in that time CD-r discs cost something like $20 each. Sure if you would expose them to sunlight, they would soon become impossible to read, and I seem to remember the gold discs being slightly less reliable than the green ones. But I still have some well-treated TDK discs from 1994 with audio on them, that still play perfectly. My point is: your mileage may vary and CD-r got a lot better since the early days when recorders were expensive big bulky machines that would cost too much for anyone but professional users. > with audio on them, that still play perfectly. … ah … yes … well – I should have said DATA. Audio on red book CDR is error-recovery protected, so you cannot really compare audio discs to data back discs. There is even more error-correction on data than on audio. Which is substantial. You can literally drill a 1/4″ hole through a CD in the active area, and it will still play. I’ve seen it done. Unbalances it, and it shatters in the drive. Unbalances, yes. But it takes a whole lot more speed than the drive can manage, to shatter the disc. I heard that this was done by a professor in an engineering class on consumer electronics. So I tried it myself. The CD still played, without skipping, and didn’t destroy anything. CDRs didn’t get better. They went through a lemon market where quality went down with prices. Making better discs would make them more expensive, and the market was already saturated with discs that claimed to last a million years and nobody could verify that, so nobody trusted them enough to pay for the better discs and all the manufacturers turned to make cheap throwaway coasters that would break in a matter of months. You could still pay $20 for a disc, but it was 90% likely to be just as bad either because it was a counterfeit disc, or the manufacturer cheated and lied. Not really. Here in Germany the entry level machines cost about 1000DM. About $500 in 1990s Dollars. I’d have said $500 was extremely expensive for entry level in the early 1990s anywhere. In the UK that was >£500 because pre-internet we had rip-off Britain prices, and I definitely remember them as being impossibly expensive. I remember buying the Sony TCD-D7 DAT-Walkman in 1993. It cost 1,300DM and I had to work (being an EE-student in the University back then) about ten days to get that kind of money. I still have this magnificent piece of audio history and it’s still getting some use once in a while. Hee, hee. Generational misnomers. I must be old. When he “burned the file to tape” really gave me a chuckle. But I guess kids these days have never “dialed” a phone number. But then again, I still see a lot of people “taping” video with digital devices. Although Optical Tape was going to be a thing back in the 90s, Creo, LOTS, Terrabank Systems, Phillips LMS, StorageTek, and Sony all were pumping R&D into it, but the maturation of optical disc and blue laser pretty much killed it with non linear accessibility. It didn’t live long enough in the wild to develop it’s own jargon such as “burn”. I remember my mother had some music albums. Literally. A typical symphony took up between five and seven discs on 78 RPM 10″ shellac. These had their sleeves bound into an actual album. Later, RCA did the same thing with 45 RPM vinyl discs. That’s nothing. why I can remember dragging the stylus by hand, across the clay tablet, uphill, both ways, in the snow, and shoes weren’t invented yet. And when we got home, we’d nothing to eat but a hand full of dust, and then our father would beat us with a tire chain, and we’d all go to sleep in our mud hole in the waste dump, and get up again an hour before we went to sleep. And we were happy with that. But try and tell that to kids these days! You all had it so good. Um… you were talking about generational misnomers. My own generation (and some that followed) had things we called “albums,” but few people knew why. That’s all. Sorry, didn’t really catch that. Never had anybody question the word “album” before. To me it’s just a collection. Pictures in a book, songs on a single LP, CD, or even a tape. I suppose an mp3 folder is still an album as well. “easy to forget the days of recordings being contained on physical media” what a dumb statement. Servers have physical media, phones/streaming-clients have physical media to buffer the stream, and the media/carrier is a physical stream (waves/particles). It is obvious to me that Jenny is referring to the CDs and cassettes that have fallen out of common use for pre-recorded media since streaming services have become so popular these days. Back in the day, sometime in the early 90s, I used a Sony PCM-7030 to transfer tapes of wild track recorded on location in Africa to 3/4″ cassette for editing. 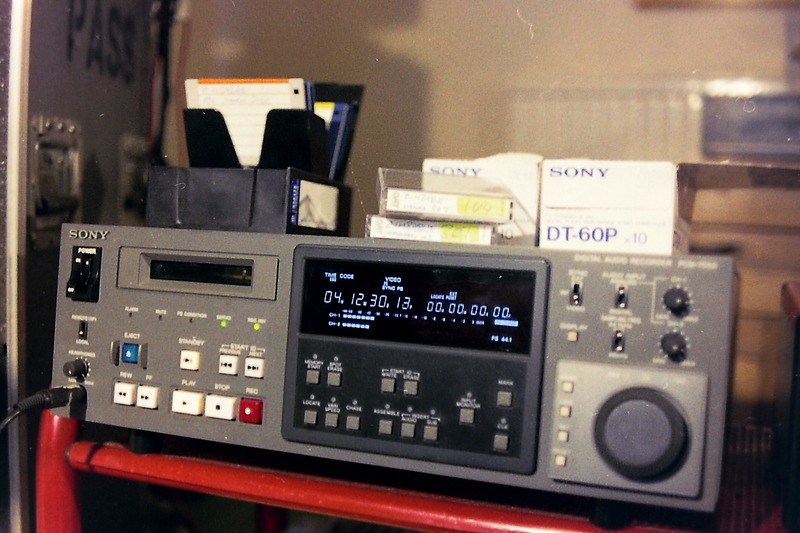 The DAT tapes had timecode, and the machine had a serial control so I could use my edit controller to sync the DAT and the VCR’s to keep the timecode locked together. The project was shot on Super 16mm film, and the norm at that time was to record the sync sound on 1/4″ tape on a Nagra with timecode locked to the camera, in this case an Arriflex. The sound recordist use a portable Sony DAT recorder for the wild-track as an experiment. The issue was battery life. Digital recorders were notorious for eating batteries! You can find one of these on eBay for £400 to £500, in used condition. A good refurbished one is around £1K. I have a friend who refurbishes them. The mechanism is still available either from Sony or a compatible version from Teac. Teac still make it as it is used in some military data recorders! That’s some classic broadcast gear, right there. Notice how the power switch and Eject button have guards around them to make it difficult to accidentally screw yourself during a live event. So let me make sure I’ve got this right. Somebody a long time ago hacked a video recording technique to record audio, and now somebody else has hacked that to record video. Got it.